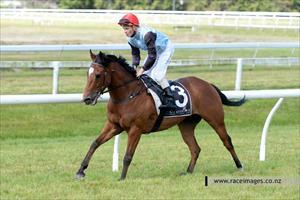 A Galloper on the Rise! Rising Son (pictured) removed luck from the equation at his third career race day outing when taking out the Maiden 1400m event at Rotorua on Tuesday in the hands of premiership leading jockey Matthew Cameron. Jumping well from his outside gate to sit outside the leaders, rider Matthew Cameron elected to take a sit on the four-year-old after a torrent of early pace was set by several runners – a key move that would assist Rising Son over the concluding stages. “It was great to see him settle in the middle stages, just behind midfield, as there were a group of horses all wanting the lead.” Co-trainer Chad Ormsby said. Rising Son is owned by a large group of Australian connections and just keeps developing the further into his preparation he goes.